This definitely shouldn’t be a meal you have every night but if you are craving something yummy and feel like takeaway this is the perfect meal for you! Everything just works with this dish and you will be glad that you tried it. Mix lamb mince with fresh herbs, onion and cumin powder. Shape your lamb mixture into roughly 8cm long sausages. Push your metal skewer over the lamb and shape it around the skewer then place onto a baking tray and refrigerate for around 30 minutes until firm. Roughly dice your cauliflower into smaller florets and place in your food processor. Blend this until it is the consistency of couscous. Once finished transfer to a larger bowl. Add all remaining ingredients and mix well with the cauliflower. If you like you can also add some salt and pepper. Notes: If you leave this for a few hours in the fridge it will allow for the flavours to infuse. Get two large mixing bowls in one bowl separate and place your egg whites and the other bowl your egg yolks. In your other mixing bowl whisk your egg yolks and cream cheese together, then add in your Psyllium husk and baking soda. Line a baking tray with baking paper and then pour the mixture onto the tray spread your mixture out to the size you want (as you can see from our photo we made ours pretty large to make it like a kebab. Place in the oven for 15-20 minutes on 160 Degrees Celsius – Keep checking the oopsie bread as all ovens are different. You want to pull it out when it is a nice golden brown. Place yoghurt into a small mixing bowl. Dice mint leaves until fine and place them with the yoghurt. Peel cucumber and cut it in half, removing the core. Then finely dice and add it with the remaining ingredients to the yoghurt & thoroughly mix together. 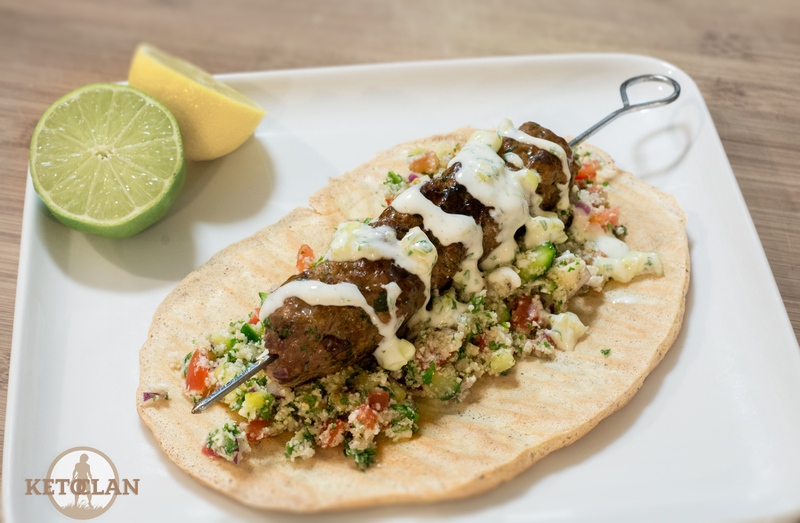 Once you have all the components together, place the oppsie bread down on a plate, spread your tabouli in the center, place your kofta on top of the tabouli, and remove the skewer. Drizzle the Raita Sauce over it all. Wrap it together and dig in for an awesome feed. Hope you give this one a try its well worth it, please let us know what you think!